I joke about how Nicholas is like the Energizer Bunny, but it really is true. He runs non-stop from morning to bedtime with no breaks to help his weary mother and father. Being a parent, I've discovered, is living in a state of chronic exhaustion. But it is still far better to have an active child than a couch potato child. You can see evidence of how active Nicholas is from his shoes. 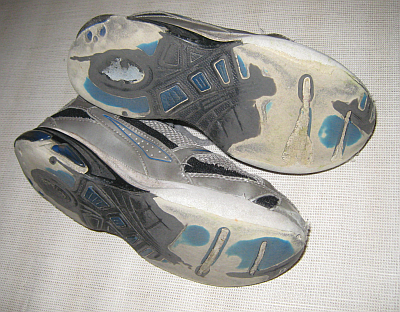 These are the bottoms of a typical pair of shoes after a couple of months. It would take me several years to wear a pair of shoes down this much. 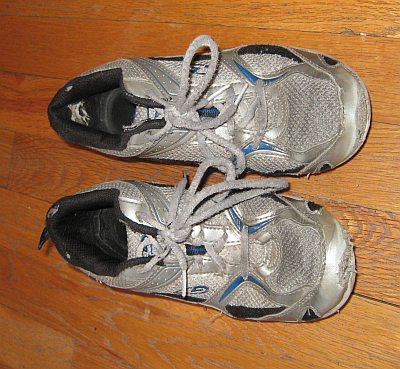 The tops of the shoes are also rather beaten up, especially at the toes. Nicholas also crawls a lot, so he busts out the knees of all his jeans. He can scoot on his hands and knees faster than some kids can run. It looks painful, but he laughs the whole time he is doing it.